As the first autumn rains soak into the earth, here on the home farm we are beginning our darkness gardening routine. As the growing season winds down, we tidy up the remnants of autumn harvests and prepare for the winter planning and planting season. Now is prime time for cultivating high-flavor culinary gems in the Allium genus of plants, which includes garlic and shallots. All Allium species are easy to grow during the winter months here on the North Coast and cost pennies on the dollar compared to buying them commercially. There's nothing more satisfying than watching their cheerful green tops grow taller during the coldest, darkest and wettest time of the year. We're also focused on rebuilding soil fertility after everything we grew this harvest season. While our ½-acre home farm is too small to support cows and goats, that doesn't stop us from making farm connections to find affordable sources of organic fertilizer. For optimal Allium planting, we soak seed material (either garlic cloves or individual shallots) overnight in a bucket with a few inches of water along with 1 tablespoon of fish emulsion and kelp powder to encourage root development. We time planting of all root crops around the new moon, when the gravitational force between the earth and moon is greatest for strong root establishment. The larger the seeding garlic clove or shallot, the larger its offspring. Mild elephant garlic adds drama to the darkness garden with its gigantic stalks and humongous developing heads. This year we spaced elephant garlic 6 inches apart to give them room to fill out and make the largest heads possible. Delicate yellow and purple shallots round out our darkness garden bed. We like to cultivate soft neck garlic varieties so we can make garlic braids and hang them around the kitchen. We tuck rings of smaller soft neck garlic varieties around the roses. Garlic and roses make happy companions. Roses require weed-free root zones and, in our cool coastal climate, they may suffer from moisture conditions such as black fungus. Garlic protects roses from aphids and fungal diseases, and keeps the rose root zone free of weeds. Before planting the garlic, we completely clear a 3-inch zone around the base of each rose and carefully fluff up the soil with a hand trowel. We tuck in individual cloves in a ring around the rose, planting cloves 2 inches deep and 4 inches apart. Once planted, we top off with organic fertilizer and mulch to make weeding fast and easy. A few years back when we were in small farm school, we went around Humboldt County visiting several small farms specializing in sustainable agriculture. Whether farm products were vegetables, flowers or milk, all the farmers we studied with and learned from had the same No. 1 message: Figure out how to source as much of your material as possible without buying commercially. Instead, try to set up mutually beneficial arrangements with other farmers. What can you offer that someone else can use and vice versa? Time, labor and friendly conversation become the exchange rather than dollars and cents. Focusing on necessity rather than luxury is where the art of sourcing begins and fellow farmers can offer experience and knowledge to anyone curious enough to ask. One big area of focus on the home farm during late autumn is building soil fertility. Our plants respond best to nitrogen-rich fertilizers. Rather than buying fertilizers commercially, we sourced field cured organic cow manure from a neighbor. He's happy to have us haul away truckloads of manure for nothing and we're glad to offer our soil high amounts of nitrogen. It might sound odd, but shoveling manure while keeping the animals that produced it company offers a fun opportunity to feel connected to our fertilizer. As we stood in the cow pasture surrounded by blue skies and a cheerful red barn, listening to geese flying overhead, we couldn't imagine a more pleasant way to spend a sunny autumn afternoon. If fresh, unseasoned manure is applied directly to plants, it may burn them rather than provide nutrients. In order to prevent this from happening to any of our darling plants, we add fresh "hot" manure to the compost pile, speeding its decomposition and also calling in our dearest earthworm friends. In addition to treating our growing plants with seasoned cow manure, we also added fresh goat manure to our compost pile. We collected the goat manure from a small dairy just down the road. 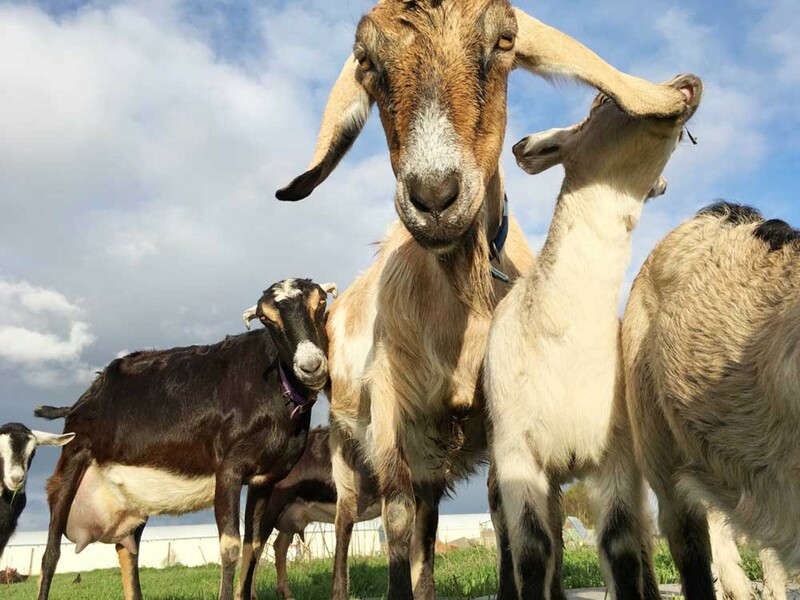 We captured some happy goat energy hanging around the animals, watched the morning milking routine and left with the most deliciously fresh goat cheese we've ever tasted. The cheese, made with love in small batches, tasted even more special after being a part of its production. Sinking further into the days of darkness, the promise of garlic braids and gigantic elephant garlic lures us into spending time digging in the dirt. We're stirring the compost into a giant heap that the earthworms will munch through and tucking away tools and materials for the rainy season. Even if it's raining, we smile and layer on our waterproofs. Homegrown food brings joy and abundance, no matter the season or the weather.